Some comments from Jasper, as no report from the organization. Perfect weather conditions for sailors and spectators to follow the game of chest on the water. The French teams were absolutely nr. 1 shouting out loud 'PROTEST' and waving their red protest flag, but in the end Team Green won with a best-out-of-three races. 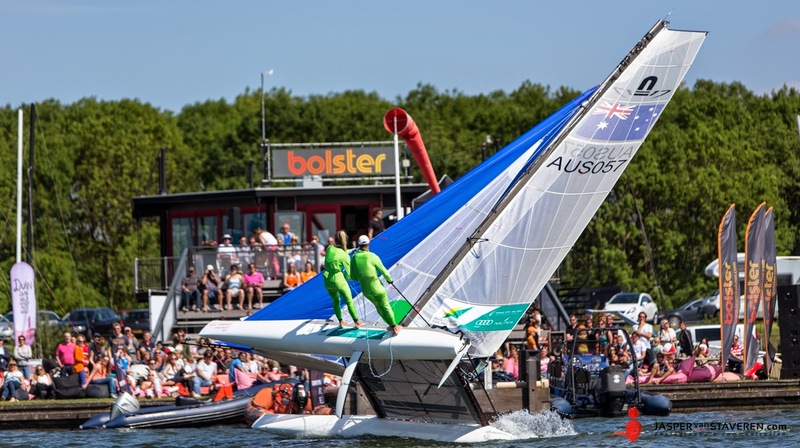 The 'Bolster Limbodancers 2014' are Elke Delnooz & Jeroen van Leeuwen (dressed up in blue on the only dutch Nacra 17.)"